Red was the first color I recognized in the picture books they read to me. THE LITTLE LOST ANGEL wore a red dress in the story painted by Janet Laura Scott. And in spite of being lost, the generous little angel gives away her crown, her wings and her harp to others in need, before she finds a happy home with a childless couple. Red figured prominently in many of my favorite picture books. When I began to read stories to my little sister, one of the first was Ezra Jack Keats’ THE SNOWY DAY. When Peter awakens to look out his window, his red wallpaper is sprinkled over with white cut-outs, much like the sight of wondrous snowflakes that had fallen during the cold night. Peter dresses in his red snowsuit with its elfin hood and romps through the stark white snow like a joyous exclamation mark across the pages. As a young mother, I recall three picture books that used red especially well and only got better each time each time I read them. The red and green in Eric Carle’s THE VERY HUNGRY CATERPILLAR were fresh and juicy! For the cover of CORDUROY, Don Freeman painted the toy bear against a bright backdrop of a red upholstered cushion, while the little girl who eagerly wishes to buy Corduroy wears a red coat. I cannot forget her sweet desire. My youngest son was enchanted by Hannah Gifford’s paintings in the book RED FOX. Up against an angry dog, finding no pond frogs or field mice in their usual places, and a rabbit too swift to catch, he is unable to forage a meal for his mate Rose. It was amusing to see only his nose or his tail peek from hiding as Red rushed around like a curvy, quick comma. I could imagine the anguish of courageous Red as, in desperation, he tries to scavenge in town to provide for his mate. Red returns triumphant with a sack that had been tossed into a trash bin for Rose, as she surprises him with five newborn red fox cubs, their red ears peeking up! The last illustration is a harmonious red family circle. Period. When teaching English to Japanese high school students in Ono and Yashiro, Japan, I fell in love with Chihiro Iwasaki’s beautiful watercolor children in natural shades with lots of rose, yellow and blues. On the cover of her TEARS OF THE DRAGON, hot steamy red clouds frame the boy Akito (“Autumn Way”) riding upon the dragon. 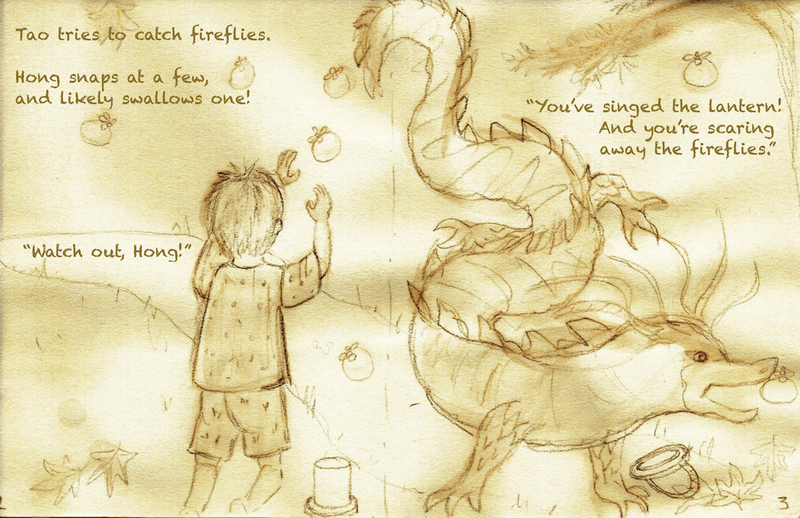 In the story, Akito wonders about the villagers’ tales of a frightfully wicked dragon who is never seen. He feels sorry for a creature so maligned, and wishes to invite the dragon to his birthday party. At the end of his long search, Akito finds the lonely dragon and delivers his invitation. The grateful dragon sheds tears at the trust and love of the young boy. As the boy rides back to the red-roofed village, the dragon transforms into a dragon-boat with a smooth, red hull, floating on the river of his tears. In Chihiro Iwasaki’s illustrations of Hans Christian Andersen’s THE RED SHOES, the color is a potent symbol of obsessive passion. When a young girl’s grandmother stitches her a pair of red shoes, they become all she can think of, leaving her unable to recall the church prayers or hymns. Vanity follows her, as well as a curse of compulsive dancing. She is unable to care for her sick grandmother, or even attend her funeral because her little red shoes will not stop dancing. Eventually she prays to have her feet separated from her body. Crutches are carved for her so she can walk. She becomes penitent and good. Here red becomes a symbol of carnal passion that is almost unstoppable, a completely moralistic tale told to urge children of the eighteenth century to turn towards the good deeds of Christianity. It is no wonder that these red shoes are reminiscent of THE SCARLET LETTER that adorns Nathaniel Hawthorne’s character, Hester Prynne, the unwed mother. I love the way Chihiro paints a field of red to enclose a white bull in her poem, PASTURE COW. Brazenly ignoring the warnings that the bull will be angry and dangerous, the children in the story observe that the bull has kind eyes, like the Buddha. In another story, GIRL FROM THE SNOW COUNTRY, Masako Hidaka makes a little bit of red as a reward for a kind heart. Mi-chan makes plump snow rabbits in her garden, but regrets she has nothing with which to give them eyes. She follows her grandmother to the market and kindly wipes away some snow covering the heads of the little guardian statues that they pass along the way. 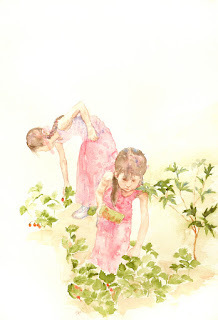 At the end of their errands, a generous market woman gives her a branch of red berries for which Mi-Chan is grateful. She plucks the red berries, placing them as eyes for her snow bunnies. 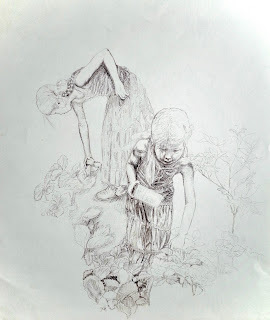 These illustrations of children propelled me into sketching and drawing the children around me as often as possible when I returned from Japan. My nieces and then grandchildren became my frequent models for illustration. I began to paint with complementary colors. Most often, in red. My nieces were born in Jiang-Xi and Hunan provinces, and I sketched them whenever I could. Red and green were so cheerful and friendly together. Even though their preferences were for pink and lavender, my first paintings of them were using rose madder pigment as they wore their red velvet jumpers in autumn, lighting the lanterns for Halloween. While teaching Japanese at Mt. Rainier High School, I prepared by reading the previous year’s International Baccalaureate examinations papers. In one was a mysterious story called, 赤い蝋燭と人魚 (THE RED CANDLES AND THE MERMAID). I was enchanted by Komako Sakai’s sad and lonely illustrations. A thoughtful mermaid desires her newborn to be raised in the land of sunlight instead of the dark and dreary waters of the sea, shown in heavy gouache strokes of black and blues. When she leaves the infant on the village steps by the sea, she is discovered by a childless and impoverished elderly couple who make candles for a living. The little mermaid is a bright addition to their home/shop as she paints red sea-inspired designs on the candles they sell, some of which become candles for a critical lighthouse on the hill overlooking a disastrous rocky coast. While everyone knows Little Red Riding Hood, a more recent picture book character known by her colorful garb is RED KNIT CAP GIRL by Naoko Stoop. She longs to meet the moon. She is an adorable and earnest standout among her forest friends, the bear, squirrel, rabbit, hedgehog and owl, as she is uniquely painted in red acrylic, ink and pencil on stained plywood. In Bomi Park’s FIRST SNOW, aside from the white, grays, black and little bit of beige-brown, the red scarf, and the red design on the little girl’s mittens, are the only obvious color. When she rolls her snowball to the other side of the woods, she embraces all of her friends, also wearing a bit of red to warm them while playing out in the cold white, snow. The wonderful warmth of red that Gabrielle Grimard dresses the girl in LILA AND THE CROW, protects Lila’s heart. It brings out our heart-felt sympathy for the lonely girl longing to make friends in a new school. But even in her bright red dress the other children ridicule her for her dark hair, dark skin and dark eyes. She is dejected and lonely and so hurt by their jeers, calling her a crow. One day she is inspired, and eventually when she accepts herself, she makes friends with the crows and her classmates! When I first opened tubes of watercolor, I chose the splashes of rose madder or alizarin crimson in the girls’ dresses on watercolor paper. Recently, I’ve experimented with thick and heavy strokes of red, carmine or scarlet acrylic gouache on canvas. Red sets a character apart.. 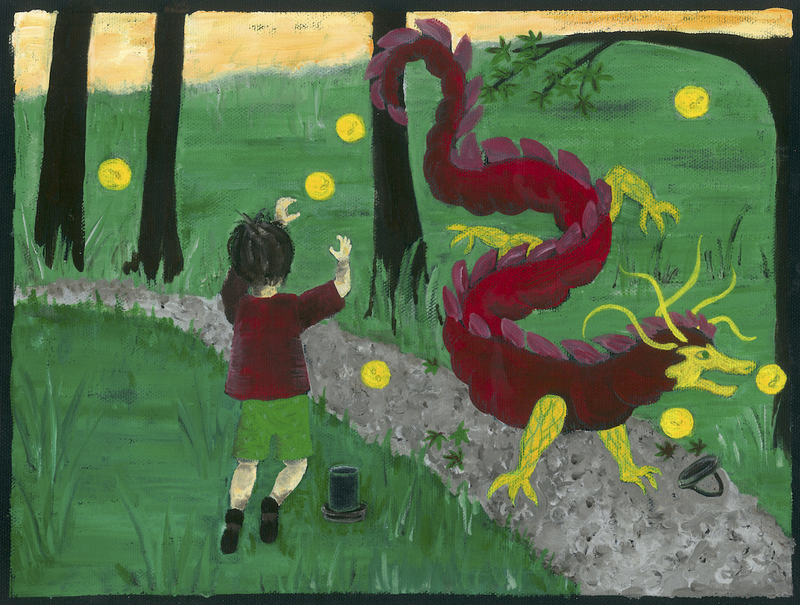 So I painted a caring boy, Tao, with a red shirt and his trusty toy dragon-playmate, Hong, also bright red, in TAO AND HONG: THE LOST BUNNY, as well as the setting late August evening sun in the story. Since TAO AND HONG: FOLLOW THE CROW, takes place while he is asleep, I chose a different palette: I reduced trusting Tao’s tee shirt to a golden orange and allowed Hong to accompany him as a lighter, but still scarlet dragon, true to his name since Hong (红 ) means “red” in Chinese. Near the end of his dream Tao discovers an old rusty red caboose, now serving as a diner, which is as bright as the sun inside. In their most recent adventure, Tao and Hong tiptoe through their dark home after they’re supposed to be asleep, on a quest to find their favorite bedtime story: Here Be Pirates! To feel brave in the dark, Tao wears a red bandana and carries a wooden cutlass. Together, they ride a red sailboat through the high seas, and discover that they have the power to recreate the story they treasure. The meaning and energy of the color red can vary greatly depending on the story. It can show up as a jewel-like treasure, clothing or accessory to offer protection from the elements, such as with an umbrella, boots, mittens or a bandage. Reds can bring comfort or pain, display heat or light, show injury or courage. Most often, red is a symbol for love and acceptance. All along the Pacific Northwest coast—from San Francisco to Vancouver, B.C.— and in and around the islands of Puget Sound, mist, or heavy fog settles. It modifies the ordinarily firm edges of houses, fences, buildings, and their inhabitants. It softens, too, the limited boundaries of images. Plants with names like “Mist Maiden,” or “Dreamland,” illustrate how indirect light touches the overall shape of a dwarf rhododendron, the contours of leaves and flower petals in the Pacific Northwest. In a garden all seems calm, soft and mutable. A veil of mist settles, then shifts through my field of inner, as well as outer vision. The images that float through transform themselves. A junco, a squirrel, a child and her/his toy are, and are not. Their very existence is in flux. In this way images appear, disappear and re-appear forcing my mind to notice and focus my attention on their shifting shapes. From these filmy shapes a character’s personality and stories emerge. At his book launch for PEANUT BUTTER & JELLY, Ben Clanton told his readers that it was when the image of a waffle ice cream cone tossed about in his mind with some photos of narwhals in a non-fiction book he had been reading that he first recalled the idea of his character, Super Narwhal. In the story of BUB, Elizabeth Rose Stanton’s middle child decides to erase himself, to become invisible. The “Mistress of fog,” Julie Kim, paints, then lifts some vibrant pigments to create a fog setting as the children search in WHERE”S HALMONI? Bonnie Becker has said in a book launch that a grumpy voice lodged in her mind declaring, “No Visitors,” as the seed for A VISITOR FOR BEAR was planted. Thoughts and ideas arise on the misty edges of the mind. Indirect light affects the mind, not just our outer vision. It feels like a damp cloud hovers over one’s brain, where images develop, swell, fade, only to re-appear with more insistence. In some of my watercolors I suggest this occurrence. Here, a child holds a tiny green frog in the cool fog. Two sisters play at the beach on a hazy day. I have been translating these cloudy moods into the acrylic gouache medium, too. Tao and Hong splash through a waterfall. A crow delivers a key before a wintry sunrise. Without the harsh precision of direct light, an idea, a character is free to evolve without too much scrutiny, or by being pinned down, or examined too soon. In 1981, Professor emeritus of Tokyo University, Kimura Shozaburo described the WORLD OF INDIRECT LIGHT: “The greenery of the rainy season is indescribably beautiful. Wet with rain, the tree leaves have a most vivid color, though their outlines are blurred. There is no sunlight to make a sharp distinction between light and shade, and the shape of these things is not necessarily clearly defined under a cloudy sky or in a mist. However, due to the fact that it is a world of indirect light, a certain amount of light finds its way to the parts which, under direct sunlight, would be darkly blotted out as shade; the rainy sky makes the shadowed parts stand out, and light and shade run together.”His description is the way I frequently view my own garden in Normandy Park, near Puget Sound. The leaves of the morning garden are frequently wet from October through April, when the cove is blurred by mist, and fog blankets Vashon Island from view. Ideas seek one out, decide to visit for awhile, irregardless of how one’s mind might be otherwise occupied.These images are insistent and envelop the mind like mist, they gift us with their presence. Professor Kimura postulates that Japanese culture truly exists in a world of indirect light where light and shade, friend and foe, man and woman constantly merge together to create a third world of serene and harmonious beauty in which there is no yes or no. I feel that in the Pacific Northwest an artist, a writer, a child is free to inhabit this harmonious space where no gulf separates opposites. Change is inevitable. Sometimes the change is purposeful; other times departures from my conception are accidental because of the indeterminate nature of the chosen medium. While unintended developments in a creation are usually considered mistakes, to invite the unexpected may also yield welcome results. Let the viewer decide. As I mentioned to Janet Lee Carey in our Dreamwalks interview last May, I enjoy both drawing and painting. The creamy, soft Yellow Ochre and Chocolate Derwent drawing pencils, or Sepia water-soluble pencils are often my first choices for drafting sketches. These pencils help me draw up the soft images from my mind. I recently learned from my Facebook friend and picture book artist, Nancy Poydar, about her process of digitally coloring her scanned sketches. That—along with Rosemary Well’s explanation of her process of character development and editing at the September 2017 SCBWI-WA meeting—has led me to examine my own comparatively antiquated illustration techniques and encouraged me to share my process. I usually sketch from models. 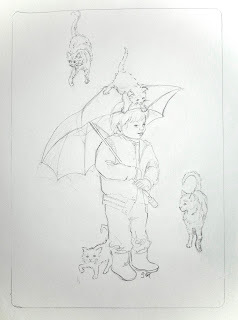 I set the drawing for my intended illustration beside my illustration board with Fabriano traditional white watercolor paper affixed or, for acrylic gouache application, a canvas. Glancing back and forth between the sketch and the blank paper or canvas, I mentally position my subject(s). I may transfer some large shapes with a pastel pencil, or I cut out the shape from the sketch to use as a template . This is where, and why, changes occur. Some are happy accidents. There is more free play involved in the painting. It is usually looser, with less attention to details, more emphasis on texture. With regard to a child subject, if the face or figure is flawed in my perspective, I’ll wash off the pigment and begin again. Essentially, the sketch is a study for the final illustration. 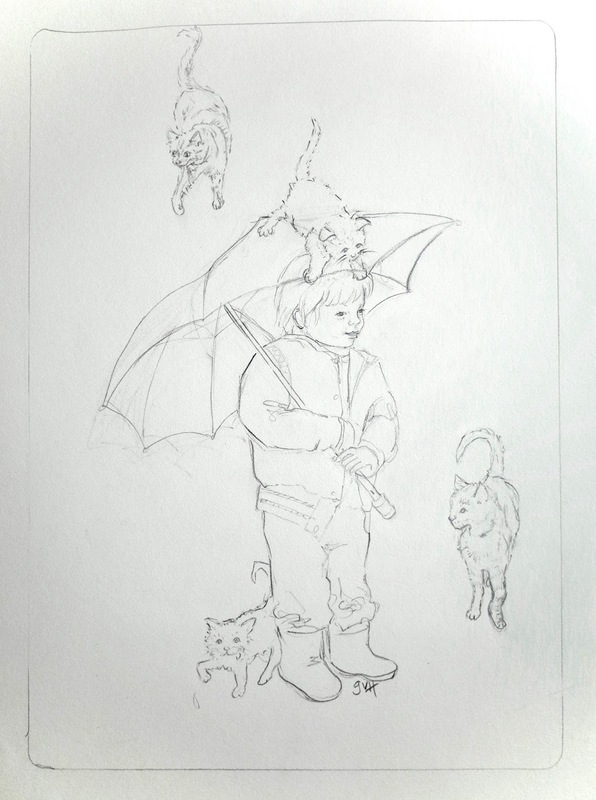 In the sketch “It’s raining Cats and Dogs,” I place the animals and child according to my heavy rain falling idea. 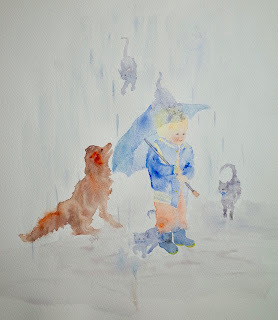 The painting is the quick result of imagining the blurry, wet cats slipping down like big, fat raindrops and the big, soggy dog splashing into a puddle. I enjoyed sketching the girls for "We Like to Pick Strawberries From the Garden," but I chose an unusual head-down perspective. I worried I might not have been able to paint those features. The watercolor was my second attempt, so I kept it. The transparent profile, the hair colors, the gauzy ribbons and the clear plastic berry box were fun! 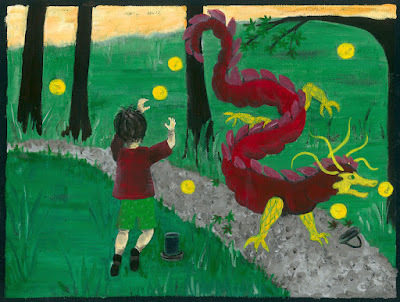 In “Tao Catches Fireflies,” I suggest the contrast between the child Tao who steps softly trying to clasp a few fireflies to observe in his lantern, with his toy dragon, who rambunctiously cavorts along the path, charring the lid and knocking over the lantern. In the painting I not only try to convey this action, but also the fleeing August sun setting over the hill, softening their bright forms. While any viewer can spot the changes between the sketch and the color illustration, who can tell if any particular difference was intentional or accidental? Training the eye and hand together doesn't always mean complete control over the final illustration. Although the modern technology available to scan a sketch and create one's own tools to infuse it with color or texture, and undo the process at any step is very appealing, working entirely with physical materials, gliding a brush over lightly textured paper or canvas threads feels second nature to me; I like to let the medium shape the ultimate expression of my characters and scenes. Welcome to my first website! It is a work in progress right now, but I hope that if you visit again soon, many of my paintings and drawings will be uploaded and ready for you to look at. Thank you for visiting!